Capturing jazz musicians passionately performing is something Ruth Williams has been doing for a long time. It was her husband, Ed Williams, that got her into it. As he taped live performances of local jazz musicians, Ruth watched, noting the physical artistry before her. The emotions and expressions of these talented musicians inspired her to start photographing the live performances and ultimately produce a book of her noted collection. Photographer is just one of Ruth’s many titles. She’s a wife, mother, great-grandmother, pharmacist, yoga teacher and gardener. Born in England, Ruth came to the US as a child and settled with her parents in Royal Oak, Michigan. Growing up, she worked alongside her mother, a pharmacist, until she met husband Ed. In 1943, Ruth and Ed relocated to Cambridge, Massachusetts, and were married at the Harvard University Chapel. The couple built their own home in Lincoln, Massachusetts, in 1948, where they raised four sons and have lived ever since. 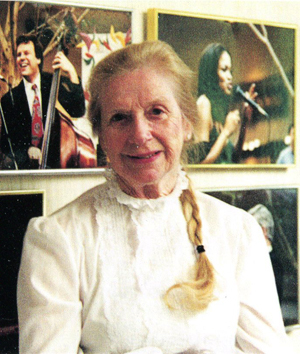 Along with the many photos of jazz musicians, Ruth has produced photographs for several yoga books by Sue Luby for Prentice-Hall. She has also photographed historical houses in Lincoln, Massachusetts, for several of the Lincoln Historical Society’s books. Photographs by Ruth have been exhibited at The Mall at Chestnut Hill, Highland Jazz, the Lincoln Council on Aging, the Lincoln and Harvard libraries, Rivercrest in Concord, Massachusetts, and the Concord Art Association where she has been designated a Distinguished Artist.